When you smile do you show more gum than teeth? Or maybe your gums seem to have peaks and valleys, falling lower in places and higher in others. Gum contouring, also called tissue sculpting, is a cosmetic dental procedure that can painlessly even out an uneven gum, or remove excess tissue in a gummy smile. Many of our contouring clients have beautifully straight and symmetrical teeth, but their uneven gum line gives the appearance of crooked smile. When the gum line falls lower than the lip it can give the appearance of small square like teeth. A smooth and even gum gives the appearance of a healthy smile and doesn’t detract from the overall beauty of your teeth. At Nashville Center For Aesthetic Dentistry we provide tissue contouring. 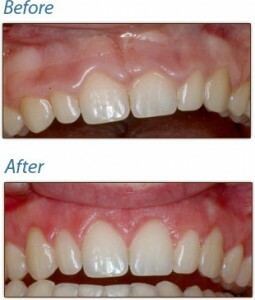 Reshaping your gums can be a simple way to improve the overall appearance of your smile. Don’t let your gums distract from your pearly whites. Dr. Dennis Wells can help you decide if gum contouring is right for you. Call us today to schedule a consultation. We also provide other cosmetic dental procedures including, porcelain veneers, and professional tooth whitening.